Solara Goldwynn is an instructor at Pacific Rim College’s School of Permaculture Design. 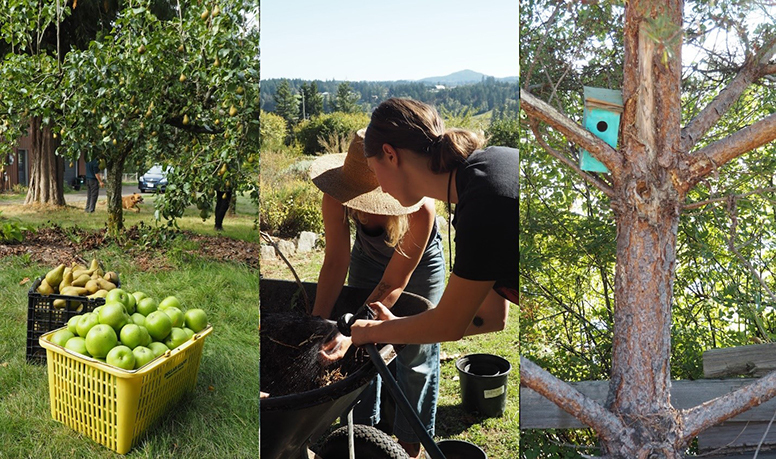 Her Perennial Plans and Design Methods classes this year have been featured in the PRC Permaculture blog. We recently sat down with her to talk about the importance of perennial plants, being an idealist, and finding inspiration in a changing climate. Hi Solara, thanks for visiting with me! 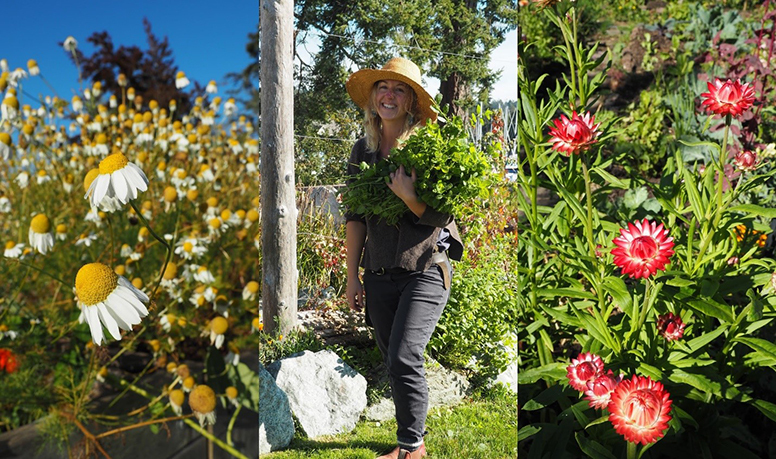 You’re an owner-operator of Hatchet & Seed, an edible landscaping and ecological landscape design business here in Victoria. You also taught our Perennial Plants class this year. A big revelation for me in class was the many attributes that edible perennial plants tend to have – carbon sequestration, nutrient density, drought resistance. Energy inputs are generally lower. But yet most of these plants feel pretty foreign to us here in the West as compared with staple annual crops. What’s your approach to “selling” prospective clients, or folks generally, on the virtues of unusual perennials? Hi Dylan! Thanks for the great question. You are definitely right that if we were to survey a crowd of Canadians about how their food is grown, it would come down to annual production. Yet a lot of the nutrient dense food we consume is perennial, think nuts and fruit. When I’m approaching clients or students about the topic I often get them to dig through their memories for some cultural connection to perennial food. For example, picking berries as a kid, stomping grapes with your neighbors, the first time you picked nettles and made soup or your grandmother’s rhubarb patch. Culture is built around food, and perennial food has some of the strongest culture connections because the food reliably comes back every year. I then will go into the benefits of perennials, as you mentioned above, carbon sequestration and deep roots that can handle fluctuations in weather being some of their top benefits. Also, you plant once and harvest over years so that always gets people excited. In terms of the unusual perennial fruits, nuts, and vegetables that you can grow and eat, it’s a process. We often have our new clients visit older sites and taste some of the food. We talk to our clients about the new recipes they’ve tried or new ways of eating something that we can share with others. Plus in Victoria, it’s more about exposing people to the fact that we can grow many things that you might not expect, such as figs, lemons, and persimmons, as well as so many indigenous perennial plants that are edible and grow effortlessly in this climate. 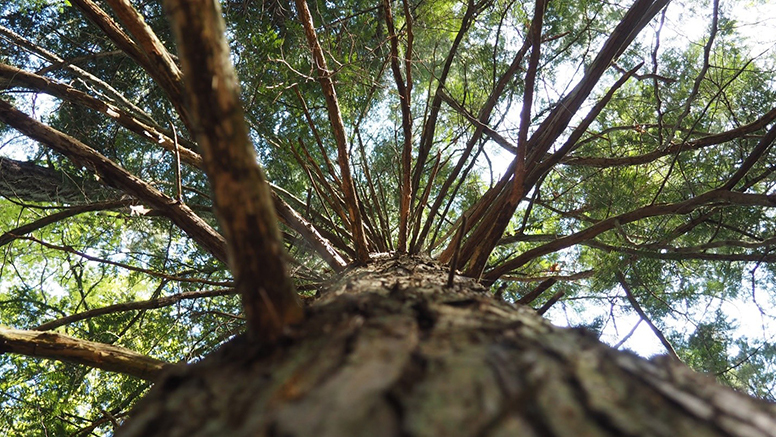 We’ve talked in class about how many of our grand contemporary challenges stem from a misalignment of human – that is, physical – and ecological systems. Most practitioners of permaculture probably like to think of the permaculture approach as a major tool for reconciling this misalignment. Do you see particular limitations to its potential? Are there other practical approaches that we should also be attentive to? The limitations for permaculture that I see currently is that it’s not reaching enough people across all walks of life. We need to quickly scale up regenerative land practices, localize our economies and our food systems, and transition off fossil fuels. Permaculture can sometimes feel like an old boys’ club or a utopian fantasy, so we need to find new ways of talking about living in collaboration with the natural world. It was a smoky summer. Growers here on the Island are noticing hotter, drier weather than in the past. You mentioned in class, maybe halfway tongue-in-cheek, that you’re working on a “plague garden” at home. All this makes me think about the Buddhist thinker Joanna Macy. One of the concepts she talks about that I find compelling is the idea of “premature equanimity” – peoples’ tendency towards detachment because the elephant in the room is too big to be acknowledged as if it’s a real problem. I think of anthropogenic climate change. “It will eventually happen, so it’s okay that it’s happening now.” How do you navigate this space between compassion, acceptance, and resistance in your life? I juggle a lot with my own feelings of dread and hopelessness for where our planet is heading. I’ve got an almost 4-year-old and I worry constantly for her future. However, I’m in a field of work that is focused on solutions. I stay grounded by working in my garden, and teaching my daughter how to grow food, and her dad has made sure she can use a hammer. We celebrate life by sharing potlucks with our friends and keeping inspired by others who are actively creating a different reality, one that is earth-based and local. You’ve been engaged with plants and ecology both academically and professionally for a number of years now. I’m curious about how your relationship with earth has changed and deepened over time and how it has influenced your approach to working and teaching. When I was in high school, growing up on the east coast, I was passionate about the environment. I wanted to be a vegetarian in a very meat dominated household, I worried about the deforestation of the Amazon and started a small environmental club at school, I cared deeply for the protestors being arrested on the west coast protecting the old growth ecosystems, and I read David Suzuki and Jane Goodall books like young adult novels. People in my family and my friends called me a hippie and dismissed my passion for idealism. That idealism led me to study permaculture and environmental studies and was the guidance to the path that I’m on today. I now see that it’s not idealism, it’s ethics, I care deeply for the earth and its inhabitants. I’m more committed than ever to building a regenerative society, and to inspiring others to do the same. Are there any organizations doing important work that you want to give a shout-out to? (In their own words: Indigenous Climate Action (ICA) is an Indigenous-led organization formed in 2015 that inspires action for climate justice by supporting Indigenous communities to build power and drive solutions to climate change. We work to equip Indigenous communities with the right tools, education, and capacity needed to ensure Indigenous knowledge is a driving force in climate solutions. (In their own words: Young Agrarians (YA) is a network for new and young ecological and organic farmers. Since we started January 2012, the network has grown across Canada from coast to coast through farmers organizing events (mixers, farm tours & potlucks, apprentice meet-ups, etc. ), contributing to the blog, adding resources to the UMAP, and more! (In their own words: Project Drawdown gathers and facilitates a broad coalition of researchers, scientists, graduate students, PhDs, post-docs, policy makers, business leaders and activists to assemble and present the best available information on climate solutions in order to describe their beneficial financial, social and environmental impact over the next thirty years.